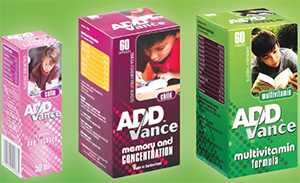 ADDvance is a specialised range of products manufactured in Switzerland and formulated with Omega 3, Vitamins and Minerals to assist children with concentration problems. Description Support concentration and attention. Brain development, support memory and concentration.